It’s the sentence that makes children shriek with excitement. Full of presents, treats, and entertainment, birthday parties are the height of childhood fun. But as parents keep upping the birthday party anti, the yearly celebration can leave families at a loss for new and creative ideas. Alas, the days of Pin the Tail on the Donkey and ice cream cake might be ending, but luckily, our area is filled with unique birthday venues to keep you up with the Joneses. 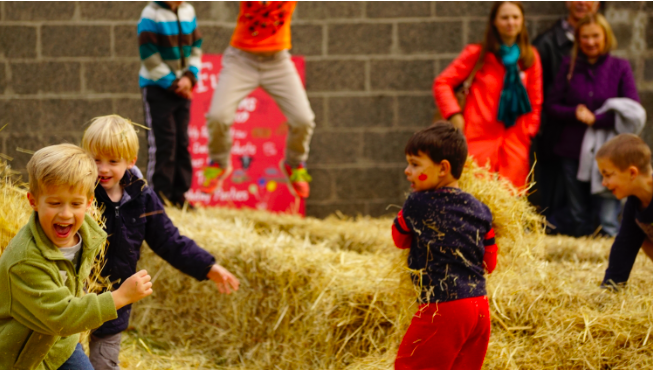 From arty parties to farm fetes, we outline party venues that will make all of your child’s birthday wishes come true. Imagine That! 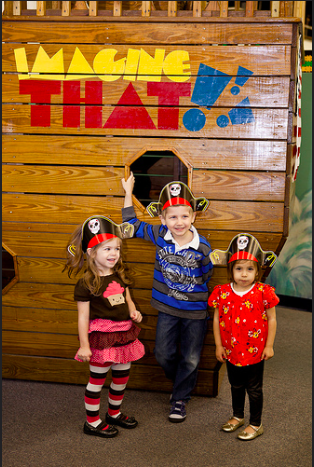 is a 16,000 square foot children’s museum with over 50 kid-friendly exhibits and five party rooms. 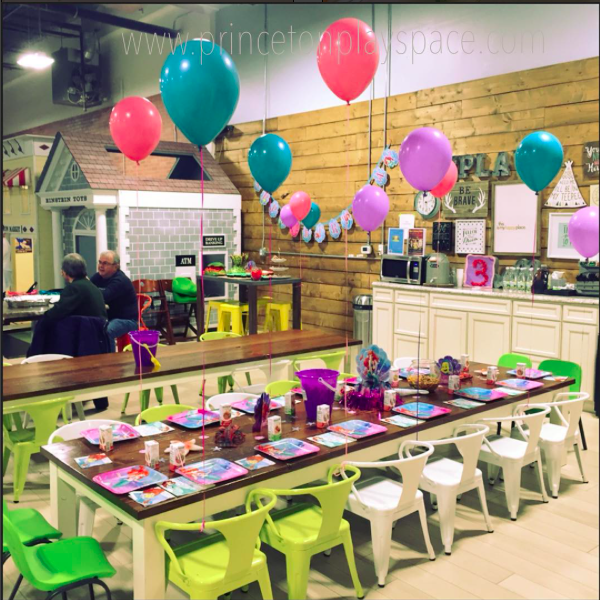 They offer 11 party packages with themes such as Pampered Pooch, Deluxe Princess Party, Sports Star, and Jungle Jamboree, as well as a Create Your Own Party option. Most packages include themed paper products, favors, a puppet show, a slice of pizza, and an unlimited amount of time to explore the museum. Party packages range from $289.99 – $599.99. Founded by speech-language pathologist Alpin Rezvani, M.A. CCC-SLP, every event at Princeton Play Space has a fun, educational undertone. As is evident on their active Instagram page, they host parties with a variety of kid-friendly themes like Star Wars, Pirates, and The Lion King. Four primary party packages are offered: Basic Princeton, Classic Genius, Custom Albert Einstein, and Party at Home, which will bring the party to you. Each option offers add-ons such as a petting zoo, face painter, and ice cream truck. Party packages start at $425. This indoor sports and recreation center allows kids to have their cake and burn it off, too! The Ewing-based athletic center recently added an indoor turf field and party center, where kids can run around, grab a freshly made smoothie, or hang out in a party room, which can be decorated however you prefer. There are three party packages: Amazing, Awesome, and Ultimate. Each includes 60 minutes of play on the turf field and 45 minutes of fun in the party room. Prices range from $257 – $450, with a discount for PEAC members. 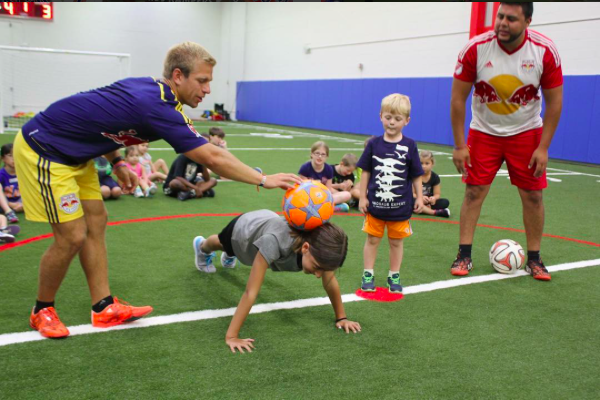 This photo from the @peacturf Instagram account shows Red Bulls training at KidsKamp, one of several events held on the turf in addition to their birthday parties. From March through December, children of all ages can be a farmer for a day at Fulper Family Farmstead in Lambertville. They offer two two-hour party packages that can include a visit to the maternity barn and milking parlor, a play date with baby calves, line dancing, treasure hunts, homemade ice cream making, and a fairytale tea party. If you’re having a lucky birthday, you might even witness the birth of a cow! Party packages range from $329 – $529. How about a party that involves climbing into a giant blow-up bubble while playing soccer in your backyard? 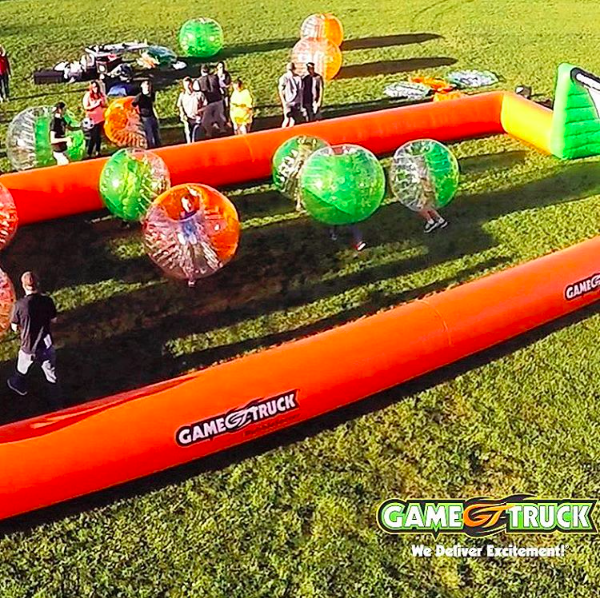 GameTruck Princeton comes to your house and sets-up a 25×50 BubbleSoccer arena, complete with eight balls in three sizes, in less than 45 minutes. This portable party service can also bring you outdoor laser tag or over 80 video game titles that can be played on the high-definition televisions right inside the truck. Price quotes for Video Game Parties, GameTruck Powered LaserTag, and GameTruck Powered BubbleSoccer are available upon request. 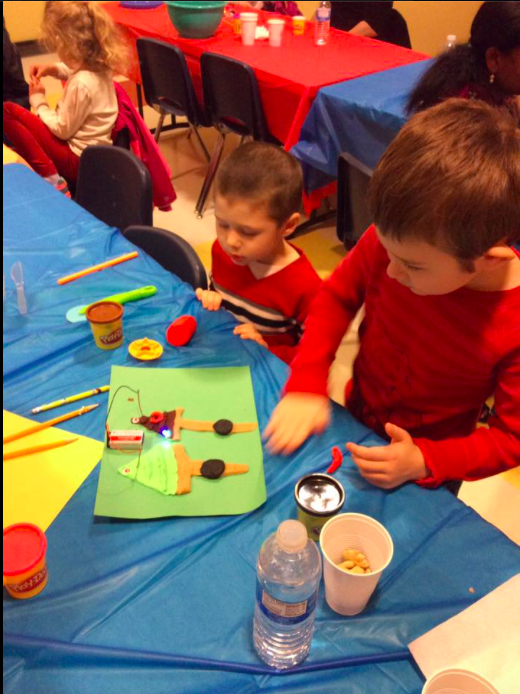 The STEAM works academy develops science, technology, engineering, arts, and mathematics skills in children through hands-on activity. In addition to classes, programs, and camps, they offer birthday parties that fuse learning and entertainment. They have nine party packages that invite kids to make active volcanoes, learn about the solar system through jewelry making, become forensic scientists, or make a Disney Frozen troll slime. Party pricing upon request. At Art Sparks Studio, children create art using a myriad of media ranging from chalk pastels to Styrofoam. The studio is run by two certified teachers, a Yale graduate, and a surface designer for an agency in New York City. 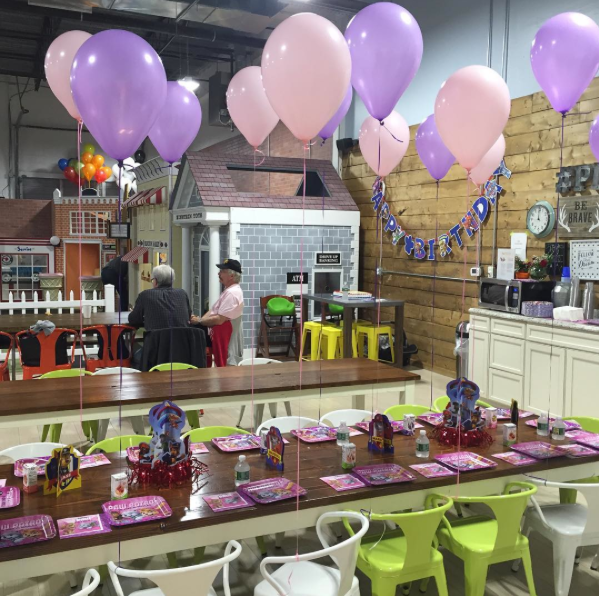 In short, their facility is full of artistic creativity and kid-savvy individuals that make it an ideal spot for a birthday party. The studio’s 1.5 hour Arty Parties provide material and instruction for a themed art project, time for cake and presents, and a birthday canvas memento painted by the party guests. The birthday boy or girl can choose one of several themes such as Rainbow, Sparkles, and Unicorns for toddlers or It’s Your Bag: A Purse Party for ages 8 and up. Parties start at $385. We promise that this venue is worth a trip to South Jersey. 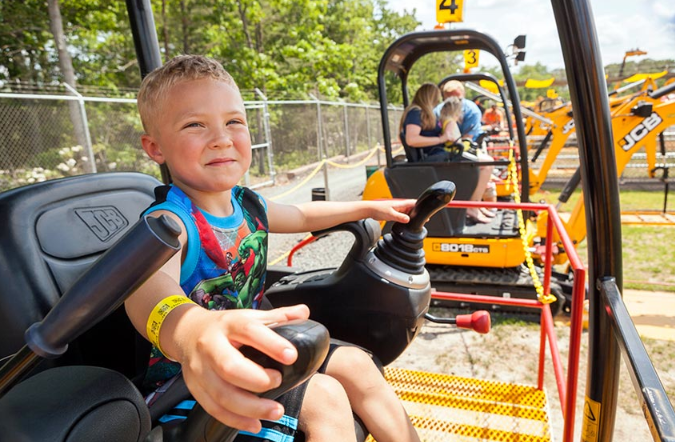 The 14-acre construction themed park allows anyone 36” and up to operate real machinery that’s been modified to allow everyone – including children – to safely operate them. Birthday boys and girls have “buckets of fun” as they enjoy two hours of ride time on all the park attractions. They can also enjoy reserved time in the Party Pavilion along with pizza, soda, and gem stone mining bags for the guests. Party packages range from $99.95 – $369, with add-ons available.